Meigs Local students of the month in attendance at the meeting are pictured with board member Heather Hawley. 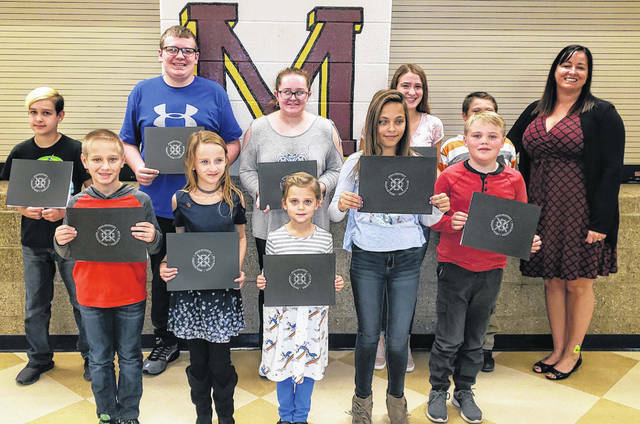 ROCKSPRINGS — The Meigs Local Board of Education honored Students of the Month, as well as approving several agenda items during the recent board meeting. Students of the Month honored at the recent Meigs Local Board of Education meeting included: Lydia Edwards, Tyler Collins, Olivia Goble, Chloe McKinney, Savanna Baker, Alex Johnson, Mallory Adams, Brayden Stanley, Quentin Smith, Bailee Shupe, Kiana Boyles, Wyatt Russell, Alexis Carter, Garrett Parry, Payton Herald, Billy Maue, Colton Dodson, Kyrstin Fackler, Lillian King, Jeramiah Martin, Woodrow Peck, and Reed Tope. The students were presented certificates by board member Heather Hawley. Honoree Colton Dodson led the Pledge of Allegiance for the meeting. In personnel matters, the board approved the hiring of Michael Adkins as a substitute teacher and Jessica Cotterill, Sandy Napper, and Christina Mather as substitute personal assistants. The resignation of Bruce Martin as high school chemistry teacher, effective Jan. 1, 2019, for retirement purposes was accepted. Larry Hunt was approved as a volunteer freshman boys basketball coach. The resignation of Amy Wilson as the service coordinator for the 21st Century program was accepted effective Oct. 23. A request for extended sick leave was approved as requested. An agreement with the Auditor of State of Ohio for fiscal year 2018 audit expenses in the amount not to exceed $26,035. Medical and prescription renewal rates effective Jan. 1, 2019. Reimbursement to a parent for transportation of a student to Carleton School. Updated and revised bylaws, policies, forms and administrative guidelines. Regular meetings to be held at 6:30 p.m. on the second and fourth Wednesdays of each month rather than Tuesdays effective with the Nov. 14 meeting. An overnight field trip request for the SkillsUSA Fall Leadership Conference. An overnight field trip for the National FFA Conference in Indianapolis. The next meeting of the Meigs Local Board of Education is schedule for 6:30 p.m. on Wednesday, Nov. 14.
https://www.mydailysentinel.com/wp-content/uploads/sites/14/2018/11/web1_11.7-Students-of-the-Month-October_ne2018116161218436.jpgMeigs Local students of the month in attendance at the meeting are pictured with board member Heather Hawley.